Pop Art at the Beach will be part of the massive Open Call show at Barndsall Art Park. Candy wrappers clothe the bathers as they look, longingly, at their various objects of desire. 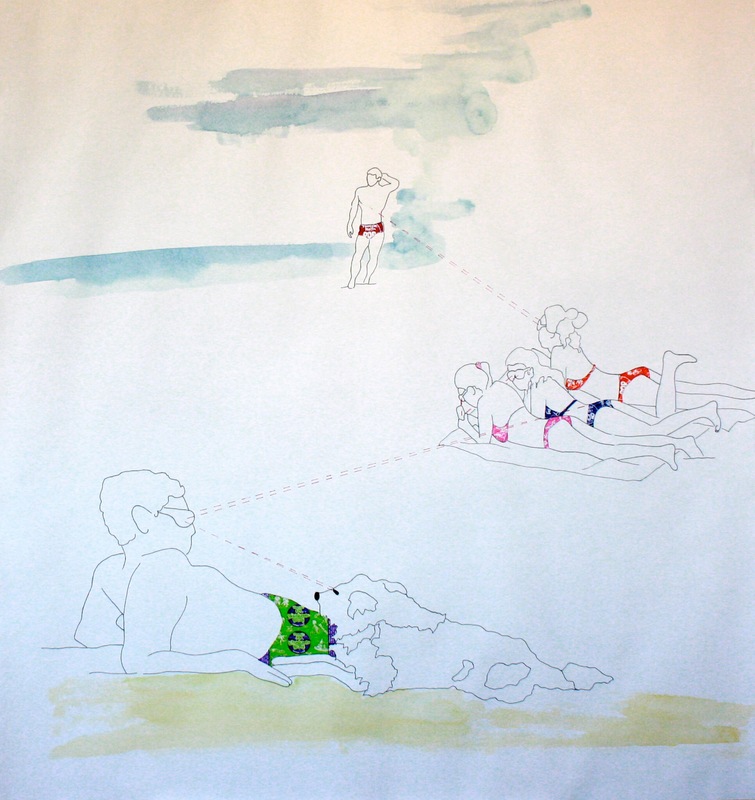 Pop Art at the Beach is watercolor, ink, and candy wrappers on 140 lb paper, 42×42 inches, black wooden frame. K. Ryan Henisey is a queer artist in Los Angeles. The art in his #ArtToEndViolence collection celebrates a passion for important and challenging social justice issues juxtaposed against a veneer of pop art. The superficiality of the genre draws attention to the violence perpetuated against communities marginalized by the dominant culture by forcing the viewer to confront what is meaningful. Ryan’s other works can be seen at the upcoming Open Show, Play, at LAMAG at Barnsdall on August 14 and later this fall in Oakland for a second installment of Viral: 25 Years from Rodney King. #ArtToEndViolence is on display at the residence gallery at Wilshire / Vermont through 2016 and Slumbering Sea and other select works are on loan to the Newhall Aquarium.